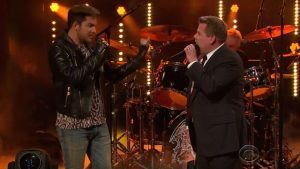 You are here: Home / 2017 Queenbert / Adam Lambert Battles James Corden for Queen’s Lead Singer Spot! 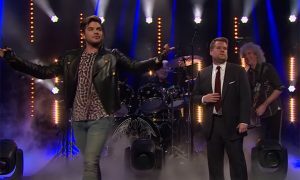 Queen’s Brian May and Roger Taylor + Adam Lambert were on The Late, Late Show with James Corden last night, scoring a perfect promo for their upcoming North American tour. Adam even got to stretch his acting muscles when he battled Corden for the lead singer spot. I appreciate Corden’s Carpool Karaoke skits, but when you pit him against Adam, the deal is done. This skit was really funny and James – you’re pretty good!! Be sure to catch it when James flips Adam off twice at 5:00 and 6:37. Check out what Adam mouths after the second time! Last night was first time Queen + Adam Lambert have appeared in concert on American TV since the 2009 American Idol finale. This promo was perfect to add new fans across the country. Tickets went on general sale this morning. Did you get some? Now who’s for Adam getting into James’s car for some Carpool Karaoke? Carol, thanks so much for sending me the “official” fan club site! I was able to join and get the presale code. 2 tix cost roughly $300 for first tier 20th row seats 1 and 2 at the Barclay Center in Brooklyn. Thrilled that my husband agreed to see them again! I really appreciate all that you do to keep this site active! Wow, that was fantastic and funny! I can’t wait for Hollywood Bowl!!! Totally AMAZING!! Yes…funny & FUN! James can sing for sure & I have really been enjoying his Car Karaoke…BUT Adam is in a “Super Star Legend” of his own!!! Thank you for posting that Carol. Adam…you just send me over the top. I adore & cherish YOU! That was so funny! He cannot sing as good as Adam! But he wasn’t that bad. I didn’t know James Corden could sing at all. Adam is definitely their front man. I don’t think they could find anyone better! Thanks for this fun Carol. I will just hope I get to see Adam live in concert sometime! They would have a hard time finding someone as good looking as Adam too! Thanks so much Carol. You always send the best of the best. I did not know they were going to be on. I saw Adam on the first time without Queen and unfortunately I can’t go to Nashville to see them. So thanks again. Now all I can hope for is a carpool karaoke with Adam. How can I become a VIP at one of Adam’s shows? That is my dream!